﻿ Around the World with Esperanto . . . . . . Esperanto Fremont . . . . . . Enrique . . . . . . in English . . . . . .
because they wanted to sell me something. because they wanted to be my friends. After enjoying Esperanto during more than 40 years, I would like to tell you about this marvelous language, so you can also enjoy all the benefits and the pleasures obtained by learning and using it. I hope these pages will answer many of your questions, but it also will create new questions in your mind. Would you please send me those questions, or comments, so I can answer them? These pages are going to be frequently updated. Please come back for more answers, and with more questions. This book also exists in Español and Esperanto. 4. So many pleasant memories. 6. Thoughts of a young Chinese woman. 20. Is Esperanto difficult for Asians? 41. Letter to the Editor. Jana Holcová, Mělník, Czech Republic. The key to cultural traveling. Ronald J. Glossop, Saint Louis, Missouri, USA. 82. Why does an American Use Esperanto? 83. Why we should learn Esperanto? "Tomorrow will be a free lecture about Esperanto in downtown. Would you like to go?" I had always known that "Esperanto" was the "international language" ... and I had been lucky that nobody ever asked me more about that, because I didn't know anything else. I saw that this could be a good occasion to learn a little more on the subject, and I answered "Yes." The next day we went to downtown ... on different ways ... He promised to meet me at the lecture, but I didn't see him there. The next week I was lucky ... I fell sick ... I had to expend two whole days in bed. When I awoke in the morning, not feeling well, still in bed, I saw the book. Nothing else that I could do ... I started to read it ... I couldn't let go ... I finished the book in two days. I suppose I read during a little more than 20 hours. By the end of those two days I already knew the structure of Esperanto, and I could read and understand all the sample readings in the book. I borrowed an Esperanto fiction book and I read it whole, with help from of a small dictionary. I recognized most of the words. I understood almost nothing. I did the same with a second book. This time I understood a good part of it. By the third book, I understood it all. Later I realized that this was a mistake. I should have started with an easy-reader, a book for beginners. Then I was lucky again. Less than two months after my first Esperanto lesson, an Esperanto national convention was happening about a mile from my house. I spent two full days there. I just couldn't believe that I was understanding spoken Esperanto, and even I had the chance to speak my new language. There, most of the 200 participants were speaking only Esperanto. Some of the people I met there became friends for life. Any time we got together, we spoke only in Esperanto. This started about 45 years ago. I found some pen pals in other countries, like China, Poland, Bulgaria, and USA. From the time I posted a letter to China until I received an answer six months could have passed. But I kept writing and saving all the letters I received. Eventually I had two pen pals in the USA. One of them started to write about how wonderful it was to live in the United States, and maybe I should try it. Then it seemed impossible, but the idea stayed in my mind ... About four years after learning Esperanto, I was in my way to New York, where I stayed for 29 years. When I arrived to New York City, I could read and understand the New York Times very well. The Daily News was a little more difficult. I needed several more years to get used to the sound of English. After my native Spanish, the first language I used in New York City was Esperanto. The intention of this page is to inform the general public about the advantages and the joy of being able to communicate by means of Esperanto. Thus, I ask the readers who have enjoyed these opportunities, to send a note to me relating those experiences. When we can collect enough of them to fill a book, we will offer this book to the public. Those interested in learning Esperanto, should notice that to study it is not just like to study other languages, where one gets tired after studying during some years and still is not capable to communicate. That does not happen with Esperanto. Many beginners begin to write within the first month of study. Then more time is needed to reach some speaking or writing fluency. If you start to learn Esperanto, please let me know, send mi a message. Later you can send me another message in Esperanto. Article sent by Claude Piron, Geneva, Switzerland, January 5, 2006. I have so many pleasant memories of experiences in the Esperanto world that it is difficult to choose one. My Esperanto life has been blessed with so many pleasant memories that when I decided to answer your request my mind felt like a throng of impetuous kids, every one rushing to be the selected one. And, indeed, one succeeded in being first out, although I don't think it has any more merit than its rivals. Here it is. I had been on the staff of the World Health Organization for a number of years. After I had left it to start a private practice, it still engaged me once or twice a year for short missions, because I could make a reliable summary record of a discussion on health matters held in a few languages including Chinese and Russian, and there were not so many people around who could do that. At some time in the 1970's, it asked me if I'd agree to go to Alma-Ata (now Almaty), Kazakhstan, to join the secretariat of a huge international conference called on to discuss basic health services. I always like to discover new countries, so I gladly accepted. I was then working on another mission in the Philippines, and when I went to Manila airport to fly to Kazakhstan via Delhi, India, and Tashkent, Uzbekistan, I was surprised to meet four former colleagues also bound to Alma-Ata. We all took the same flight from Delhi to Tashkent. At the time, Uzbekistan and Kazakhstan were still part of the Soviet Union. When I travel, I always try to get in touch with local Esperanto speakers, a good way to know the country I visit through personal contact. So I had written to the delegito ("local representative") of the World Esperanto Association in Tashkent to inform him of my arrival. He had replied he would be at the airport -- this was pure kindness on his part, because the association's representatives are not expected to do that -- and had asked me to send him a photograph so that he could recognize me. When our group reached the tiny arrival hall, only four persons were standing there awaiting incoming passengers. Two stood together in the left corner, and two in the right one. The contrast in their faces and attitudes was extraordinary. The first two ones looked depressed, overwhelmed, dejected, the second ones full of pep and enthusiasm. "Saluton!" ("hi", "hello"). The word resounded loudly in the hall. It came from the right corner. Both men who were standing there came up to me almost at a run and hugged me warmly as if we were loving relatives who hadn't seen each other for two or more decades. My colleagues were flabbergasted. They just couldn't fathom who were these two men who seemed to be close relations of a colleague who had never said he had any acquaintance in Soviet Central Asia, even when we were flying there. It was all the more astonishing since, while one of the two, a man maybe 50, looked -- apart from his clothes -- like any European man-in-the-street, the other one was an Uzbek in his early twenties, with jet black hair, slanted eyes and definitely Asian features. 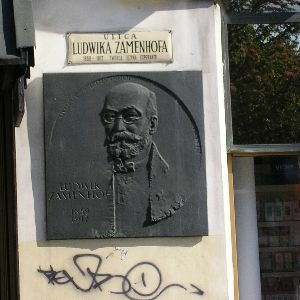 A scientist, he was the chairman of the local Esperanto club, his companion being the WEA delegito, a Ukrainian by birth. While the three of us started talking in rapid Esperanto, the two somber ones came up to our group. They explained they were doctors working for the Health Ministry of Uzbekistan who had been sent there to welcome us. They addressed us in heavily accented and rather awkward English. The joyfulness of the two Esperanto speakers seemed to crush them completely. Maybe they were afraid that some spy (or spying device) would report them to the authorities as incapable of extending a really cordial welcome to the noble guests coming from afar. "Ni iru mangi, mi invitas vin, la tutan grupon!" ("Let's go eat, I invite you, the whole group"), said the young Uzbek – it was dinner time – but when I translated for my colleagues, they hesitated: "We shouldn't. He doesn't know us, why should he invite us?" When I explained their reluctance, the young chairman asked me to tell them that this was Uzbek hospitality, and he led us to a nearby restaurant. We all followed him, including the doctors from the ministry, who looked more and more uncomfortable. The meal was very pleasant. At my end of the table, we discussed politics and social affairs in fluent Esperanto. My colleagues didn't understand everything, but they picked up enough international words to know what we were talking about. As they told me later, they couldn't believe their ears. In Soviet Union, discussing such subjects without, obviously, any inhibition… how was this possible? "You really do speak this Esperanto! ", said Mauri, a colleague, on our way to the hotel. Mauri and me had been working in the same unit for at least seven years, and I had often extolled the virtues of Esperanto emphasizing how well adapted it was to communication in intercultural settings. I had told him now and again that the language was both easy and rich, that I didn't have any problem to reach a good level in it, and that I spoke it quite often because I collaborated with an Esperanto cultural center at home. So, he should have known. But before he heard me that evening, he hadn't taken me seriously. The discrepancy between my repeated testimony and his image of the language -- a project, a remote ideal, a hobby without any practical value -- struck me as most interesting. Apparently, Esperanto, even if described from the speaker's experience, belongs to the field of unbelievable stories. The following day, the authorities had planned an official visit of Tashkent for the WHO group, accompanied by the two gloomy doctors. "Ne iru kun ili, ni vizitos la urbon private" ("Don't go with them, we'll visit the city privately"), the young scientist had told me after dinner, and he duly called at my hotel the next morning. My colleagues boarded an Intourist minibus while I got in the car he had managed to borrow from his office. We followed the tourist bus for a few minutes, but soon went our own way. I was shown things – slums, for instance – that the "official" group never saw. Once, when we were passing a river on a bridge, I asked my new friend what was its name. "It's not a river," he replied. "It's a canal. It was built by Cyrus, many centuries ago, when we were fortunate enough to belong to Persia." Unfortunately we didn't have much time. A few hours later I had to be back at the airport to catch the Aeroflot flight to Alma-Ata. There, I faced an unexpected problem: how to find room in my already full hand baggage for the big water melon my new Uzbek friend had insisted I took along, saying that this was the area with the best fruit in all USSR. I hope he will never read this text, since I'm ashamed to confess that, finding no solution to my problem, I left the water melon at the airport. In the plane I kept musing about his trust. This was Soviet Union, at a time when the communist regime was chasing dissidents with a vengeance. He had no means of knowing I was not a communist who would expose him to the authorities. Was he simply happy-go-lucky, carefree, the devil may care? I don't think so. Such people usually are superficial, which he definitely was not. When we discussed, we discussed in depth, without taboo, and without restricting ourselves to light subjects. True, at the very first second when we met in the airport, we felt a community of spirit. A lot can be transmitted and received in just a glance. But can you stake your life, or at least your freedom, on an intuition? Maybe his trust is the reason why this memory stands out. Article sent by Betty Chatterjee, Denmark, December 30, 2005. I've always wanted to visit Poland. Poland and Denmark are neighbors and it is normal practice for neighbors to visit each other. What is more, my maternal grandparents were born there. They fled to England about 107 years' ago. As they have both been dead for a very long time, I never knew them. That is probably why I have always dreamed of visiting the country of their birth. Actually I had already visited Poland twice, but both times had been a disappointment, mainly because there had been no genuine contact with the Poles. Let me explain. Both in 2003 and 2004 I traveled by Danish tourist coach throughout Poland. We visited many beautiful cities: Warsaw, Kracow, Poznan and Zakopane, etc. Everywhere we eulogized about the impressive monuments. When we visited the concentration camps and Hitler's winter quarters we were struck dumb by feelings of abomination. We traveled through seemingly never ending forests, and we were delighted to see the many storks that still flourish in Poland. Danes are very sentimental about storks, because in Denmark they are virtually extinct. Everywhere the guides competently lectured about the Polish history, geography and culture. Whenever we stopped for the night at a hotel, there were brief encounters with smiling receptionists who issued the keys to our rooms. Later we met the waiters who in serving our dinners politely managed to ignore the often bad manners of their guests. Although Danes and Poles are neighbors, the language problem often hinders effective communication. To cut a long story short, there was absolutely no personal encounters with the Polish people. It was almost as though they were invisible. When I came home after the second holiday, I decided that the next time I would go alone. What is more, I would arrange the journey myself and concentrate on meeting the Poles. In the autumn of 2004, I started planning this trip. At the time I had not ever dreamed of becoming an Esperantist. I capitalized on being an over-privileged native English speaker and therefore I got in touch with potential host-families in Poland by means of www.hospitalityclub.org. Before the end of the year I had received firm offers of accommodation from two hospitable families in Warsaw and Lodz. In the mean time I had met a kind, elderly gentleman called Georg Kustosz who has been an Esperantist for over fifty-five years. We both share a keen interest in languages and humanism. Georg was born in Breslau (now Wroclaw) in Germany (now Poland) in 1923. His father was Christian and his mother was Jewish, because of this he fled to Denmark shortly before the beginning of the Second World War. Since then he has re-visited Poland several times, using his Esperanto net-work, especially Pasporta Servo (free accommodation service for Esperantists) to meet people. He convinced me that Esperanto was useful both for cultural and tourist purposes. My new year's resolution was to learn Esperanto and I did just that. In March I began corresponding in Esperanto with fellow Esperantists in Bydgoszcz and Lodz in Poland. Afterwards I joined Pasporta Servo and rang Stanja, an Esperantist and retired teacher in the town of Solec Kujawski near Bydgoszcz. I began looking forward to this journey in a way that I had rarely ever done before. The 18th May 2005 I flew to Warsaw where I was to spend the first four days with a charming and hospitable English speaking family.. Wojtek the husband was especially knowledgeable with regard to Polish history and culture and an extremely good guide. He was also interested in practicing his English and insisted that I ruthlessly corrected his few errors. When I told him that I was learning Esperanto, he was very surprised that I should bother, after all English is the international language, isn't it? I have noticed that skepticism seems to be the norm when talking about Esperanto. During the first three days of my stay there, the host family was at work, so I explored the city on foot. The grave of the founder of Esperanto Ludvig Zamenhof is in the Jewish cemetery and I decided to visit it. The grave itself lies peacefully in a somewhat overgrown avenue close to the entrance to the cemetery. Christians show their respect by placing flowers on graves, Jews do it by placing stones. Because of this, before leaving Denmark I had collected several beautiful pebbles from the beach, which I placed on his grave. The next port of call after Warsaw was Lodz. There I stayed with an equally kind, hospitable English speaking family. Elsbieta the wife was also very interested in improving her English; so once again I tried to repay their hospitality by correcting her few errors. In Poland where there is 20% unemployment, education is taken very seriously. The family's thirteen year old daughter is extremely hard-working. In her spare time she goes to English conversation and Swedish lessons. She has already decided that she wants to become a doctor and intends to go to medical school in Sweden. Once again the family was flabbergasted by my interest in Esperanto. It was in Lodz that I met my first Polish Esperantists. As I mentioned before I had started corresponding in March with an Esperantist from Lodz and before leaving Denmark I had made arrangements to visit her. Her name is Mirka and we already knew that we had much in common: the same age, Esperanto beginners, proud grannies and long-time divorcees. Without much trouble I found her apartment and arrived on time. On the table were home-baked cakes and fresh coffee. We sat down and started chatting to each other. For both of us it was a special occasion, our first Esperanto conversation. Mirka speaks Polish, Russian and Esperanto. I speak English, Danish, French and Esperanto. We managed perfectly well! Although neither of us were fluent speakers we could still talk about our hobbies, computers, fellow Esperantists, children, grandchildren and naturally our ex husbands. In our case, without Esperanto it would have been impossible to do this. Unfortunately we were interrupted by the telephone and who should it be but her ex-husband who happened to be in town and had to pop in to visit her. That was the end of our cozy tête à tête! However not before we had arranged a second meeting at a café in Lodz where I was to meet two other Esperantists. My last port of call was Solec Kujawski where I stayed with Stanja. She met me at the station and we traveled by bus to the car park on the outskirts of town. During this ride we chatted non-stop in Esperanto. Stanja is a skilled Esperantist and is not afraid of using it. In the bus was a young girl who kept on staring at us. Politely Stanja explained to her that we were speaking Esperanto and that it is an international and neutral language. Many times during my stay, I admired the way that Stanja never missed an opportunity to demonstrate, in the best possible way, the language and its' possibilities. During my stay at Stanja's I nearly forgot that I was a foreigner. She let me take part in her everyday life and I met the entire family, except for her daughter who lives in London. 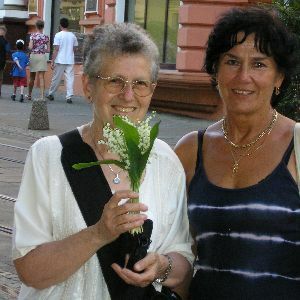 May 26th is Mother's Day in Poland and we went to visit her mother. During my stay, we talked openly about many things, and we did it in Esperanto. After all, it is our only common language! Whilst I was there, I also met other Esperantists. My pen friend Eva and her family and Johano and his family all live in Bydgoszcz. They were hospitable and attentive guides and they gave me some wonderful books in Esperanto including one with Esperanto translations of Polish folk songs. The last night of my stay we sat in Johano's garden, singing these songs, until very late. The following day I took the train back to Warsaw, where I spent the last night in a hotel close to the airport. It was comfortable, thoroughly soulless and it reminded me of my first two frustrating trips to Poland. Thus ends the account of my first Esperanto expedition. Elsbieta and her family have already visited me. Both Stanja and Mirka have promised to follow suit next year. My own name will be in the Pasporta Servo handbook next year too, so I look forward to receiving guests from all corners of the world. In addition, I have already started planning my next trip, which will be to the Ukraine. I sometimes ask myself that question too. Article sent by Lina Chen, Beijing, China, January 4, 2006. When I was a child, my grandfather, the intellectual, used to say that the English language was the international language, and he incited me to learn it diligently, so I could travel around the world and communicate with everybody. Thus, for the first time, I understood the concept of "language". Once, when I was in high school in my parents town I met a foreign tourist. He asked me how to get to tourist spot at Qingshui Yan. He spoke other language, not English. Because we couldn't understand each other, he wrote the name of the place as pronounced, and drew a sketch of it. Then I finally understood him and I directed him to the right place. After that I realized that the English language wasn't always a solution. Then I decided to learn another language used around the world. Just then, during my second year at the university, they asked some students to learn Esperanto. I answered at once and I was accepted. From the beginning I found that Esperanto was relatively much easier to learn. I started to progress fast, and I read many novels. Within one year of learning Esperanto, I was reading full size books and I could freely express my thoughts and communicate with others. In July 2004, after my first year learning Esperanto, I participate in the 89th Esperanto World Convention, in Beijing, as a volunteer. Can you image two thousand people from more than 50 countries freely communicating with each other? I was also talking with many of those foreign people without any language problems. During that world convention I did experience how easy was to use Esperanto, and how practical were the results. Thus I enjoyed the sense of sharing brought in by Esperanto. 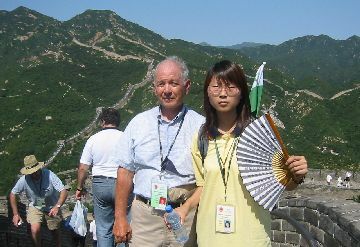 I was one of the tourist guides accompanying the Esperanto-speakers to several attractions, for example, The Great Wall of China. I had to tell them about the history about all the places we were visiting. Everybody understood me without any problems. I found that most Esperanto-speakers are gentle and caring. After the convention, I corresponded with people from many countries, and I learned about the customs of people from other cultures. Most of my correspondents don't understand English, but all of them understand Esperanto. After learning Esperanto, I admire not only its logic, its simple structure and luck of exceptions, but also its internal idea, that brings equality, brotherhood and peace. Sent by Enrique, August 22, 2006. In July 2004, I participated in the Annual Convention of the World Esperanto Association, in Beijing, China. During the last day at the Convention I met Professor Ji Yingeng from Shanghai, who invited me to stay at his apartment when visiting Shanghai. One week after the Convention, I went to the city of Shanghai. Professor Ji Yingeng learned Esperanto many years ago. His wife of a few years never learned it. Professor Ji Yingeng waited for me at the airport, and from there we took a city bus to go to his new apartment, where he and his wife lived during less than two years. I stayed with them during two days. Professor Ji Yingeng and his wife accompanied me through this modern city and also through some areas with very old houses. Together we visited a beautiful store owned by their friend, where they sell Chinese souvenirs to the visiting tourists. Later we visited other friends in a very old house, which didn't look too well. There we were invited to have dinner with them. When my host's wife wanted to speak to me, she had to speak in Chinese, her only language. Her husband had to translate it to Esperanto so that I could understand her, and then again, he had to translate my Esperanto to Chinese for her. "Now I can see that Esperanto is a language for people. I am going to learn it." From that moment on, she began to repeat everything what I said, and I am sure that she couldn't understand what she was saying. Her pronunciation was quite good. She demonstrated a great desire to learn Esperanto, the language for people. Is Esperanto difficult for Asians? Sent by Claude Piron, Geneva, Switzerland. Many people says that today, English is the world language. It is the language spoken everywhere on our planet, including in Asia. If, in a discussion on this subject, a participant express the idea that English is too difficult for the great majority of Asians, and that to force them to use it makes them feel inferior, it will be denied immediately. More yet, if he says that Esperanto offers a solution definitely more acceptable. Esperanto, they will retort, is as difficult as English for the non-European people. But these assertions are always a priori, they never emanate from a person who took the trouble to check the facts. This situation gives a quite different image than the quotations shown below. Follows a series of statements from Asian people who testified that Esperanto is for them much easier to learn than English or other languages. 1. "Even among English teachers the standard of English is low. Many cannot keep a conversation in English". Jamaliah Mohamad Ali, director of the linguistic training program at the University of Malaysia. 2. "... just 19 percent of the people questioned in a survey about English in Hong Kong felt comfortable when communicating with native English speakers - about the same level as in Japan and Thailand. More than 30 percent were afraid to speak English." 3. "Currently, I teach organization and administration of libraries in a university in Tokyo. In Japan, they teach Esperanto officially in ten universities, although unfortunately it is not yet the case in mine. Obviously, Esperanto is much more easy that European languages. The Japanese study English during more than 10 years, but they are not able to speak it, even for a simple conversation." ... Having learned basic Esperanto, understandably I wanted to learn more. I could hardly find books about Esperanto in regular bookstores, so I had to search used bookstores. Luckily I found some instructional books, dictionaries and others about Esperanto and I immediately bought them without hesitating. I read those books with a thirst. Thanks to the reading, I gradually started to enjoy Esperanto literature. Now, when I read a sentimental novel in Esperanto, I weep as it touches my heart. I really enjoy that. I never felt that much joy when I read English books, even though I've studied English for 7-8 years and Esperanto for only 4-5 months. Translated from the Esperanto original by Chuck Smith. The English and Esperanto texts are side by side on this web page. 5. "Hong Kong undoubtedly knew some English, German, or French professors, but by far, the professors of English are the most numerous and most visible. There is not a Japanese university or great industrial group from Taiwan which does not employ some Americans, Australians or British, whose exclusive function is to teach English. Alastair Pennycook is a professor of linguistics applied to the university of Melbourne. When he was a student, he also made easy money by teaching English in Hong-Kong and in China. He noted that the use of English as a language of communication remains artificial. The level reached by its students never allows them a communication going beyond the current needs. Worse still, as an English professor, everyone wishes to speak to him in this language but they realize very quickly, that this type of contact does not enable them really to discover the society where they live and even less to be integrated into it." Charles-Xavier Durand, "A universal language or a colonial language? ", Forum Quebec Avant-garde (before-garde_quebec), message 23035/28313. 6. "For Angus Mui, geography class was the worst. He says he could make out 'at most 30 or 40%' of what was being said. The other classmates also couldn't understand the teacher's English. "So most of us just read comics, daydreamed or fell asleep, " says Mui. Louise do Rosario, "Tongue-Tied: Hong Kong's Bilingual Education Backfires", The Far Eastern Economic Review, June 30, 1994. 7. During her youth, Qian Mingqi, who was for many years an associate professor of English at Huadong University in Shanghai, China, decided to become a teacher of English, and to that end she devoted much of her studies to learning that language -- four years of high school, five years of university (1956-1965). Ultimately -- after the hiatus caused by the Cultural Revolution -- she reached that goal, filling a faculty position in the university from which she graduated in 1965. She was one of the earliest Chinese academics to visit the United States as a "visiting scholar" at San Francisco State University. In her last year of university, Mingqi decided to add a second foreign language to her repertoire, and chose Russian, which she actually studied for some weeks. Then, one fine day, a "high government official" (otherwise unidentified) appeared in the Russian classroom. "Next year's World Esperanto Congress," he told the students, "is to be held for the first time in Tokyo. The People's Republic of China wishes to be represented there by a cadre of enthusiastic young Esperanto speakers. Those enthusiastic young Esperanto speakers will be you, you, you ..." She was one of the young people chosen -- she was not a volunteer -- and found herself studying Esperanto instead of Russian as a second foreign language. As she told me, years later: "I was surprised to discover that after one semester of Esperanto I could read and write that language more easily -- and far more comfortably -- than I could English after almost nine years of study." Ultimately, she would teach not just English but also Esperanto in her university -- in classes from which she had to turn students away because there were too many of them for the size of the classroom." 8. "Today, in China, they begin to study English before ending the elementary school, but at the end of ten years of study, a great number of students are unable to speak it. As soon as they open the mouth, they are taken by shame and fear. They say that they do not feel qualified to learn a foreign language. But Esperanto is very logical and easy to pronounce. In little time they usually speak it. That encourages them, and helps improve their results in English." 9. "In June 1998, a survey carried out by the BBC among its listeners to know what they thought of the idea of doing of English the single official language of the European Union, a Korean researcher, Kin Hiongun, answered: "Korea invests enormous amounts in the teaching of English. If I could have used my time in my own way, I could have obtained five doctorates in the years that I was obliged to study English. 10. In my opinion, Chinese people learn Esperanto much more easily than European languages. Moreover, the Chinese who have previously learned Esperanto enjoy a considerable advantage over other people when they study European languages. 11. "We, Asians, learn Esperanto, not "more easily", but "ten times more easily" than the European languages!" Ma Young-tae, Lecturer in Dankuk-University, Seoul, Korea. 12 "When Roy Harris, specialist in languages, arrived from Oxford to occupy the English chair at the university of Hong Kong, it was convinced that Hong Kong met the ideal conditions to be used as model for the future bilingual communities of the 21st century. But he was disappointed. The hundreds of student-assignments in English which passed between his hands were stuffed with errors and he was constantly confronted with students unable to talk clearly in English." Jay Branegan, "Finding a proper place for English", Time, September 16, 1991, p. 51. 13. In Hong Kong, at the end six years of English at a rate of three hours per day, that is to say 3600 hours, half of the students fail the final test. 14. "It's very worrying," says Legislator Henry Tang, who sits on a public education body that is spending increasing sums each year to improve the English of secondary-school graduates. "The poor standard of English has reached epidemic proportions," he says. So concerned are big companies such as Hongkong Bank, Hongkong Telecom and Swire Pacific that they started a HK$20 million (US$2.6 million) campaign to improve employee's English. Young people in Hong Kong commonly communicate in a hybrid of English and Cantonese, "a kind of Chinglish," points out legislator Tang. Teachers say Hong Kong-style bilingualism is hampering students' ability to express themselves. "These days, they are using a lot of hesitancy words, like 'eh, er, laur, lur, lor'," says David Tang, head of the Community English Language Lab." 16. "I am an Iranian student who studies in Paris to acquire a doctorate in sciences. During my studies I always studied English and then, when I came to France, I put myself at French. I also studied Esperanto and I must recognize that it is the only language, besides my mother tongue, in which I feel well. I do not feel at ease in any other foreign language. Esperanto gave me the capacity to affirm me and to communicate with others. I think that it is appropriate to all the people as well, in particular in Asia". 17. Mrs. Nan comes from the proximity of Hong Kong. In 1999 she heard in the radio about Esperanto and started to learn it by herself. "For me was simple to learn it. And that they always expect you to know English, is unfriendly", said the 27 year old lady. "For 500 children in the world, Esperanto is the paternal language" _Frankfurter Rundschau_ , September 13, 2002. 18. " Education Minister Chaturon Chaisang said that most students' inability to communicate in English despite spending years learning the language, pointed to a clear failure in language-teaching in Thailand." Chatrarat Kaewmorakot, "Calling for an overhaul of the teaching of English in Thai schools", The Nation (Bangkok), August 28, 2005. 19. Millions of people negotiate and bank and trade in English every day. They must have gotten the hang of it by now. "I am getting hang?" asks Satoshi Nishide, managing director of Daihatsu Auto in Prague. Mr. Nichide, 31, studied English for 10 years and has done business in it for nine. He and his Czech staff sit at a table in their office behind the showroom, groping for the hang of it. "Means... I depend on it?" wonders technical manager Vladimir Moravec. Spare part managers Milan Jandak: " I'd like to have it?" Sales manager Arnost Barna: "I'd like to stop it?" "I know the phrase," Mr. Nishide says. "But I don't know." Barry Newman, "World Speaks English, Often None Too Well; Results Are Tragicomic", The Wall Street Journal, vol. LXXVI, n° 110, March 22, 1995. 20. I'VE been learning English for about 10 years. But take a good look at what we really learn. We may do quite well in those tests and get the various kinds of certificates we want, but when we turn to speaking and communicating -- the language ability that really counts -- we are just at a loss for words, as if we've never learned this language. Harry Wang, "Speaking must be focus of English language teaching", Shanghai Daily, February 9, 2006. Sent by Pierre Bertrand, France. I learned Esperanto two years ago. I had known about Esperanto and during some time I already acknowledged its humanistic philosophy. But I doubted about its efficiency. Also, I didn't wanted to learn one more "dead language". Latin was sufficient. I preferred to learn the Italian language, that language with the pretty sound. But I didn't have enough time to learn Italian. In the meantime, a friend of mine, who speaks Esperanto, incited me to learn the international language. I refused in the beginning because the mentioned qualities, but later I thought that the best way to know if Esperanto was efficient, it was to learn it. I was surprised to discover a beautiful, rich language, which allows to express all the ideas and feelings, and has a pleasant elasticity. It is like a language game, it is incredible and logic, and a literary work of art. I have not yet participated in an international meeting, but I already made friends with pen pals all over the world. This language revived my desire to travel and to know people from other countries. I am sure that the effort made by the people that loves Esperanto helps other people to understand our valuable human diversity and the deep union of the human race. Each step towards peace is welcomed. An acquaintance of mine who for some years taught in a school in La Honda, a small community in the forest on the peninsular skyline south of San Francisco, once decided to start teaching Esperanto to her students, but before she did that, she had to get permission of the school board. So she gave them a long song-and-dance about how much Esperanto would help the kids' English. No one, she later said, was as surprised as she was when one of the Board members approached her on the street one day, and said: "Hey, all that stuff you told us about Esperanto? It's working! My kid is now correcting my English!" TAHLEQUAH -- Phil Dorcas learned something about Tahlequah's worldliness when he walked into a fast-food restaurant here recently. "Saluton, Sinjorino Magallon. Kiel vi fartas?" The language is Esperanto, invented in the 1880's by a Polish-born physician who wanted a common second language people all over the world could use to communicate with one another. Dorcas, president of the Esperanto League of North America, could hardly believe he was hearing it in a fast-food restaurant in northeastern Oklahoma. "If you go to Poland or Croatia or somewhere where 30,000 or more people speak it, that might be more common," Dorcas said. "In the United States, I've never heard it just by chance. That was a pleasant surprise." It was no surprise for Dorcas' companion, Beth Magallon. The longtime teacher at Tahlequah Junior High estimates she has introduced at least 350 students to Esperanto -- including the Burger King cashier. As a result of her efforts, Tahlequah may have the largest concentration of Esperanto learners in the United States, where the language is far more rare than in Europe. "I do know this," Magallon said. "It's been taught to more people in Tahlequah than anywhere else, at least in this part of the country." Magallon had not even heard of Esperanto four years ago when she started teaching an "Exploring Languages" class to seventh-, eighth- and ninth-graders. The textbook included a brief unit on Esperanto and provided an Internet address for the Esperanto League of North America. "I was blown away," Magallon said. "I felt so stupid. How could something this big exist in the world and I'm pretending to teach a language course and didn't know it existed?" Magallon learned that an estimated 2 million people in more than 100 countries speak Esperanto along with their native language. She discovered an Esperanto-only school in Mongolia, and Esperanto clubs across the United States. Magallon was drawn to the invented language because of its simplicity -- there are only 16 rules of grammar and no exceptions. That made it a perfect vehicle for introducing middle school students to languages, she said. "They can do the harder languages once they have the Esperanto in their brain," Magallon said. "They get the language part." Dorcas agrees. He said even young students learning Esperanto can grasp concepts like verb tenses, conditional moods and imperatives. "You can actually help young people learn about language itself because the nouns, phrases, verbs, conjugations and the way sentences are hooked together are so simple. You don't have to worry about irregularities." Magallon quickly became a student of Esperanto, collecting dozens of dictionaries, study books, story books, tapes and other material in Esperanto. With scholarships from the league, she attended three summer immersion schools in Vermont and became friends with Dorcas and other Esperanto speakers. "I think Esperanto is an awesome language," said seventh-grader Dianna Sinclair. "After I learned some Esperanto, it was easier to learn Spanish." Luke Littlejohn thinks he will be able to use Esperanto in the future. "I think it will help me because someday I want to be a missionary and travel the world," he said. Eighth-grader Hannah Blake seemed surprised by her own response to Esperanto. "I actually like it. I think I might want to take it again, like next year or something," she said. Whether that will be possible is uncertain. Swelling Spanish enrollment cut into Magallon's time this fall and she had to drop her Esperanto-only course although she still teaches the three-week unit in the languages class. She does not know what will happen next year, when a proposed realignment may move all the upper-level language teachers to Tahlequah High School. If so, Magallon said she will plead with the principal to give her at least one Esperanto class, which students could take as an elective -- not to satisfy the graduation requirement for two years of a world language. "I'll shadow his door because I will not be happy teaching only Spanish up there. It's too satisfying to teach Esperanto to give it up. "Esperanto is just so much more fun." Esperanto is a language invented in the 1880's by Dr. L. L. Zamenhof, a Polish-born medical doctor who wanted a simple way for people of different countries to communicate. In Esperanto, each letter has only one sound, and the accent is always on the next-to-last syllable. There are only 16 basic rules of grammar, with no exceptions. And the vocabulary incorporates many international words such as telefono (telephone), biologio (biology) and matematiko (mathematics). Today, at least 2 million people in more than 100 countries speak Esperanto as a second language. Meetings and conferences are conducted in Esperanto. Books and periodicals are published in the language, and daily radio broadcasts are increasing. Source: Esperanto League for North America Inc.
California Aggee, is the student newspaper of the University of California, at Davis, California, USA. This copy is offered with the permission of the author. 1. Although I lived in New York and spent an enormous time learning English, I am never on an equal footing with a native speaker of your language. I will never master English as I master my mother tongue and Esperanto. 2. I've devoted infinitely less time to Esperanto, but I always feel on an equal footing with an Esperanto speaker, however exotic. 3. In my travels, I've had more contacts with average representatives of the local populations in Esperanto than in English. (English is OK with airlines, big hotels, travel agencies and business people; Esperanto much better for real contacts with the life of the people). 4. In an international setting, communicating in Esperanto is less tiring than in English or in another national language. Esperanto is structured in such a way that It requires much less effort from the brain. 5. Esperanto is easy to pronounce for practically all peoples, even Anglo- Saxons, whereas English is difficult to pronounce for most inhabitants of the planet. English has too many too fine phonetic differentiations, as in but, bat, bet or bet, bit, beat. I remember the laughs when a delegate at the UN pronounced "My Government sinks", before a short pause, instead of "thinks". The inadequacy of English as an international language has catastrophic consequences on aviation. Just ask pilots. 6. English has many international words with a meaning different from international use. Think of the plight of Danish Minister Helle Degn who meant to say, at the outset of an international meeting, that she had just taken up her functions and said: "I'm at the beginning of my period". It is much easier to be ridiculous in English, if you are not a native speaker, than in Esperanto. So Esperanto is fairer (or is it more fair?) than English, or, for that matter, than any other national language, as a means of intercultural communication. 7. Of all the foreign languages that can be learned, Esperanto is the most cost effective as to the relationship between effort and ability to communicate. On an average, one month of Esperanto affords a communication level equivalent to one year of another language. Sent by Jana Holcová, Mělník, Czech Republic. If you are thinking that as a young lady, I choose as a husband somebody that already spoke Esperanto, you are going to be disappointed. Now I am retired, a widow, but long time ago I used to be young, beautiful and an independent woman. Happily, at that time I bought a small apartment in a town near Prague and far from the place where I was born, where I was leaving before with my authoritarian mother. I met a young man, that I liked very much and I thought I could marry him. I decided to introduce him to my mother. Short time before that, my mother gave me an old "Lada" sewing machine, and told me to take a class to learn sewing. Because I was always an obedient daughter, I went to the Cultural center near my new apartment, where they were teaching some classes. There was big advertisement on the wall, where they announced language courses for English, German, Spanish and also Esperanto. There was also the sewing course. I already knew about Esperanto because I had read about it in "Junák" magazine, and immediately I decided to take advantage of the chance to learn that attractive language. I went to the office and asked the clerk if I could take the sewing class and the Esperanto class. She agreed, enjoying the chance of having a student taking two courses, and then proceeded to fill the registration form. Then she remembered that both courses were scheduled the same days at the same time. What could we do? She proposed the other languages and started to show their advantages. At that time not many people were interested on learning foreign languages. It was different for the sewing course, for which there were too many students. I thought about that for a moment, and then I decided against her advice. I choose the Esperanto class and promised that I will take the sewing class the next semester. I started to learn Esperanto and I had a very good teacher, whose name was Josef Vítek. After one month we decided to visit my mother with my boyfriend for the first time. We were a little uncomfortable, afraid of what could my mother say. But everything was going well, my mother was happy with my choice. Then she asked me how I was doing with the sewing class. I told her the truth, that I was learning Esperanto instead of sewing. My mother was angry and told my boyfriend to tell me to change my stupid decision. But my dear Karlo then said: "I know many women who can sew, but I don't know any that knows Esperanto. I am happy, because we already started to study together, she made the right decision." I liked what I heard. Even if I was hesitant to get married, now I believed that a man, that stands by my side against my mother, is certainly a good husband. If he had agreed with my mother and insisted that I should learn sewing, I wouldn't think about marrying him. Having always to be obedient to my mother and then also to my husband wasn't something I was looking after. After a few months, during one of my mother visits, she said that she was traveling every week to Poděbrady to learn Esperanto from Mr. Pytloun and also went to Hradec Králové to buy Esperanto books for me. At that time, Esperanto books were not available in regular book stores. After a few years there was a big party in our family -- our uncle and aunt celebrated their golden wedding anniversary. Our daughter was the flower girl. During the party I was talking about how I choose Karlo as my husband, what made me take that decision. Karlo surprised me, and with a smile, he said: "My mother became a widow when I was 13. She sewed at home and her three daughters were professional seamstresses. Their sewing machines required constant maintenance and fixing them was my responsibility, leaving little time for my own hobbies, mainly playing music. The house was full of fabrics, threads, remnants ... Many of their clients were always around. I didn't like that. That many seamstresses in one family were enough for me." And it was really enough. Soon our own daughter started to sew, taught by her grandmother. Our daughter also took a written Esperanto course for beginners, so she could talk with our guests from other countries. I never regretted that when I was young I took that decision. The course and the husband I choose well. Also my mother, who is now over 80 years old, enjoys to participate same Esperanto meetings, because she still has a joyful "green heart". My name is Daniel. Many years ago -- I am not going to tell you how many, so you don't think I am and old man -- I heard something about Esperanto: that it was the universal language, or at least a project for a universal language. Some years after that, somebody else mentioned Esperanto. Maybe it didn't success, I thought, because I didn't hear any more about that, neither he had any news about Esperanto. A few years later, by the door of the National University, on a tree on the sidewalk, there was a sign that said: "Learn Esperanto, the Latin of the democracy". Was it like Latin? That was a very difficult language to learn. If Esperanto was as difficult as Latin, maybe that was the reason it has not succeeded. I wasn't going to study it, but at least, I knew that Esperanto still existed. Another year went by, and I went to the public library looking for some books, and just by chance, I found a textbook to learn Esperanto. Going through the first pages I started to read the introduction. The author said that you couldn't learn Esperanto without knowing grammar. That wasn't attractive to me, and I left the textbook on the shelf, and took home a science-fiction book. Once at home I told my son that I found an Esperanto textbook in the library. The following week I visited the library again, but then we went together with my son. I returned the science-fiction book and looked for another. Then my son called me: "Daddy! I found two books about Esperanto here!" and he pointed to the concerning shelf. "Did you? ", I asked. "Yes", continued my son, and continued, "But wait ... there are more books! ... four, five, maybe six books about Esperanto! Come, and look! I went there, and was surprised to see several books about Esperanto. I perused them and choose two of them to take home. My son wasn't very interested because he wanted to learn English, but he was willing to help me study Esperanto. I learned the pronunciation and taught him. Later he read the exercise questions and I answered them. He did the corrections, according to the answers on the book. He also helped me to memorize the table of correlatives. When I finished with the books I returned them to the library and borrowed some of the others. When I finished reading all the Esperanto books in the library, I wanted to read more, but not textbooks, instead books about anything written in Esperanto. I couldn't find them. I searched in another library without any luck. I remembered that almost all the books I had read were old books; the newer one was from the 1970's. "Does Esperanto still exist?" I asked myself. Maybe I have learned a language that no longer exist. So, I lost only three or four months -- I told myself. One day, after somebody informed me that there was a new search engine in Internet, I tried it to see how fast it was, and to find out how much information it will find about anyone subject. I tried several words, and then I wanted to try something a little more difficult, which word should I search? The first word that came to my mind was "Esperanto"! It showed me a huge number of pages in or about Esperanto. Incredible! I started to read some pages. Most were about learning Esperanto, or texts in Esperanto, many of them books translated to Esperanto. My heart started to swing towards the Esperanto side. That way I started to love this language. (Esperanto Koresponda Servo), that had a long list of Esperanto-speakers wanting to correspond. I wrote some letters to people on the listing, but many didn't respond. Maybe those e-mail addresses weren't working anymore. I sent my own advertising to be placed on the list. After some time, I received messages from Russia, Hungary, Slovakia, Italy, and Colombia, from people that wanted to correspond with me. I was very happy. I also searched the word "Uruguay" together with the word "Esperanto" and found the site from the Esperanto Society of Uruguay. I couldn't believe that. Even in Uruguay, my country, exists Esperanto. I wrote to one of the addresses on the page, bur I didn't receive an answer. I tried another, and soon I received his answer where he told me that they will invite me for the next time they would get together. I thanked them, but I didn't expected another letter from them. A few days later I received an invitation for the next meeting. The day of the meeting I was there very early. They received me with an Esperanto greeting, and then they welcomed me in the local language (Spanish). Other members of the group were coming. They started to chat in Esperanto. It was a surprise to me, that I could understand almost everything they said. It was the first time I heard anybody speaking Esperanto, and I was understanding almost everything! That was the proof I needed to be sure that Esperanto is really easy to learn. Still I needed another proof ... how to talk with people from other countries, who don't understand Spanish. But that I will leave for another day. On a December morning in 1939, heavy clouds formed in the sky while the mother of little Jarmila and Ladislav was washing her family's laundry in the cellar. Such work was more complicated then than it is now. For a family of four, it took almost all day and this chore had to be done every two weeks. The clock's hands showed 10:00 but Mom's work was not even halfway done. She felt a sudden fatigue and unusual nervousness. She began to stop her washing frequently and to look at the door, as if someone were standing there. No, no one was in the laundry room with her, but her efforts to keep working were in vain. What had happened? Who was thinking of her? Was she going insane? Were the children okay at school? Had something happened to her husband Jan? Was he the one thinking of her? Mom did not finish the laundry that day. She was near collapse, without strength, without hope. Her husband was one of thirty men whom the Gestapo had taken away that day. But why? Why? She did not know the reason. How will we live having been branded "an enemy family''? Will I be able to find a job to support my family with my husband gone? Will my husband return healthy, will he be able to endure everything? If the Gestapo comes for me too, who will take care of the children? Who could answer so many questions? Mom's parents tried to calm her by helping her as best they could in such a bad situation. Nazism was spreading like wildfire throughout the whole country. Every day more people were arrested for so-called treason. Neighbors and acquaintances were afraid to associate with any family from which someone had been arrested. Many people did not return home and many were taken to the gas chambers. But fortunately, in 1943 her husband Jan returned home after four years of imprisonment, although he was sick and weak. He had been punished for typing up antifascist fliers. The Gestapo ordered Mom to pay half the cost of Father's four-year prison stay because he was freed. So our family lost a beautiful concert piano, a typewriter, valuable pictures and all of our savings from the bank. Six torment-filled years of the Second World War passed. Its aftereffects gradually lessened, things calmed down and the Czech nation began to freely work with all its might, with hopes of a better life in a peaceful world. However, the shift to a socialist regime brought more difficulties. Small private stores, workshops, small factories were nationalized and the currency was drastically devalued. Mom's brother, who was living in Prague, had problems after his export business was nationalized. They only allowed him to work as a temporary director until a national committee could select a more suitable person-preferably someone with a working-class origin. When Mom visited him, unannounced, with her children, she found his villa closed up and empty. The neighbors told her that her brother and his wife had fled the country and the house had been ransacked. The only remaining item was in a corner, under a window: an old, large trunk filled with photo albums from his childhood. Our family's fear and consternation were awful. Mom's brother said nothing and did not write, for fear of causing us problems. His parents especially felt the loss of their son. Was it possible that they would never see him again? Would he come home after many years away? In which country was he now living and how was he? These and other similar thoughts were constantly in their minds during this long, sad time. In the meantime, Mom's children grew up, finished school and found jobs. Ladislav became an electrician and Jarmila worked in the office of an electric plant. Her coworker there regularly received beautiful postcards, which they looked at together in their free time. This colleague corresponded worldwide using the international language Esperanto. While looking at the postcards, Jarmila yearned to know where her uncle and aunt were now living. Some time later Jarmila's grandparents received a postcard from Bombay with four words: Srdecný pozdrav posílá Mirek - `Cordial greetings from Mirek.' What great happiness this caused! Their son was alive! Yes, far away! But it was undoubtedly his handwriting. Without a return address ... How could they contact him? He certainly did not write more for fear of worsening his parents "and relatives" situation. Besides the beautiful brochures and postcards from abroad, Jarmila's coworker sometimes brought a small book and said that it contained the addresses and telephone numbers of UEA (2) delegitoj (`delegates') from 80 countries. These delegates help-free of charge-to solve the problems and requests of other Esperantists. No other association has such a conspicuously organized network of delegates in so many countries. With great interest, Jarmila leafed through a booklet entitled Jarlibro 1953 (`1953 Yearbook') and found the country India. Looking closer, she found the city of Bombay and the name and address of its delegito. Her interest immediately grew when her colleague agreed to contact the delegate in order to look for Uncle Mirek. Jarmila decided to learn Esperanto. She began to attend the meetings of an Esperanto club every week and her kind teacher could soon praise her diligence. After she had studied for two months, he helped her write her first letter to the UEA delegate in Bombay. Six months passed but the longed-for letter did not arrive. Jarmila also began corresponding with other Esperantists from other countries to perfect her language skills. But suddenly a postcard from Bombay arrived and on it was only one sentence: adreso de sinjoro Smith. (`Mister Smith's address') Was the name correct? Her uncle's name was Skácel. Did he have to change his name? Jarmila preferred to say nothing at home because she was not too certain that the address was correct. However, she wrote a letter-with only a little help from her teacher-and mailed it off. It contained Jarmila's proposal to correspond as well as a description of herself and her family. Approximately three months later Jarmila received a letter with photos from Bombay. She was very happy about that and surprised the family with her news. Everyone was happy. Perhaps you are wondering whether Mister Smith knew any Esperanto. Of course not. Jarmila learned from later letters that after her first letter arrived in Bombay, her uncle visited the UEA delegate, who translated it. They exchanged letters in this fashion for about a year; meanwhile the situation improved and Czechs could correspond in their native language and her grandparents could write to their son themselves. The Smiths emigrated from Bombay to Australia. Her uncle worked on big crane ships. His interesting letters were like novels which brought his life in that faraway country closer to all his relatives. However, her family never saw the uncle and his wife again. Both of them passed away in that distant place. And the years went by ... and went by ... Jarmila remained faithful to the international language, which took firm root in her life. She came to love it, even like a member of her own family. She tirelessly spreads the idea of Esperanto. 1 "Jarlibro" is the Yearbook from UEA which has more than two thousand addresses from Esperanto speakers in as many as 80 countries. 2 Universala Esperanto-Asocio, the "Universal Esperanto Association," which is the largest international organization for Esperanto-speakers. Its Central Office is located in Rotterdam, The Netherlands. International Hospitality Service using Esperanto. then this page is definitely not for you. Don't read on! Please go away. then maybe Pasporta Servo is something for you. Pasporta Servo is a hospitality network, currently consisting of some 1350 hosts in more than 85 countries around the globe. To join the network as a guest, you only have to buy the address list, which is updated each year. Then you can use the service. Each host has specified some conditions, for example on the number of guests or days, or notification in advance. Hosts won't charge you anything, many will even offer you breakfast or a perfect dinner, but if you come for a week with four people, you'll understand that some may ask for a small contribution. The price of the list covers our administration costs. This can't be true. What's the catch? Well, OK, there's one important condition. You'll have to learn Esperanto. The application form is in Esperanto, the address list is in Esperanto, and all hosts speak Esperanto. No, wait! It's not as bad as it seems. Esperanto is an easy language. Easy grammar, no exceptions, recognizable words, everything you always wanted in a language. You can learn it in six months. If you're a bright language student, one month may be enough for a basic conversation level. "Pasporta Servo" (Passport service) of TEJO, the World Organization of Young Esperantists, is a unique service that was started more than 30 years ago, in 1974. While providing a service to Esperanto-speaking hosts and guests, at the same time it demonstrates, easily and clearly, to the outside public that Esperanto is useful and that it works in practice. Many people learn Esperanto only because they want to travel by means of Pasporta Servo. You've never heard of it? Let me explain. With Pasporta Servo it is possible to travel inexpensively. It is an international hospitality network. You can stay at 1364 hosts in 89 countries that appear in the 2005 edition. At the beginning of every year a new list of host appears. If you buy the list, you may use the service. Very simple, isn't it? And if you hitch-hike, you only have to pay for food while you are traveling. This is an excellent way to get to know countries and people with the help of Esperanto. For example, we ourselves stayed at a Finn from Mikelli, who showed us the hospital where she worked, at the mayor of Kassel, where we camped in the garden, and we were allowed to use the sauna of a host from Helsinki. KusxiIt is even possible to save the cost of the list. If you become a host, you will receive the new list of hosts every year at no cost which means that you can use the service at no cost. And besides that, you will meet interesting guests. Of course, hosting takes place according to your own conditions that you publish in the list. For example, many hosts require a written request in advance, while others simply say 'come at your own risk, but I am away often'. Many say 'bring a sleeping bag, you will have to sleep on the floor, and I have only one room', but several offer a bed in a separate room. Almost all hosts mention a maximum number of guests and duration of stay. Often only one guest for one night, but sometimes 10 guests for as long as a month! Many hosts offer breakfast while others ask a small repayment for that. We, for example, hosted several Hungarians who unfortunately left their (very tasty) sausage in our fridge, two Koreans, who finished our Spanish pepper in one breakfast, two Germans, who wanted to dry out after several days of camping in the Dutch downpour, a family of Swedes, with who we juggled on the grass, a group from Tajikistan, with who we sang and played guitar, and an American, who was very amazed by the fact that the Dutch "turn every word into a diminutive". Pasporta Servo is interesting for people of all ages. Young people host in their student rooms, and discover the world through hitchhiking or by train during the holiday months. Sometimes they stay at people who are four times their own age, but that does not hinder pleasant conversation and interesting interchange of experiences and ideas. Families are often willing to host several persons, and use the service in the same way. Older people have a lot of time for traveling and prefer the more comfortable host addresses. And when the age starts to make traveling more difficult, they can still receive interesting guests in their own homes. Most importantly, the list is practical. It is a compact, light, A5-format booklet, which one can easily consult during traveling. The last edition crams 23 maps, 1364 addresses, an introduction and index into 224 pages, and only weighs 155 grams (and you won't need a magnifying glass to read it). The list is available through the book service of the World Esperanto Association for EUR 15 (2005 edition). This may seem like a lot, but keep in mind that, through sales of the list we have to cover all costs of Pasporta Servo, among which are publishing, and sending it at no cost to more than 1000 addresses world-wide! If you want to use the service as a guest, you can buy the booklet through UEA, or another Esperanto book service. Each edition appears in February. Another option is to join the service as a host. In that case you will receive the booklet every year, and you may use the service - free of charge! can give you more information on all the options. Pasporta Servo is unique, inexpensive, practical, enriching and fun. Join now and start to discover the real world! Information about learning Esperanto at the end of the book. Actually, because Esperanto depends so much on its written form, the quantity of written material in Esperanto often is a great surprise to non-Esperantists. Fortunately, we have our special libraries which collect those materials and our booksellers who are ready to sell the new literature. One is able to become acquainted with the culture of Esperanto not only in books and a lot of magazines but also in songs and plays and by means of the Internet, videotapes, compact disks, and broadcasts from radio and television stations in may lands such as Poland, China, Austria, Italy, Brazil, and Korea. Why does an American Use Esperanto? New acquaintances at times express surprise when they learn that I, an American, use Esperanto instead of English in Japan. Sometimes they don't even believe that I am really an American, because they have only heard me speak Esperanto. Friendship. On long trips I have noticed that the majority of people who speak to me in English are not interested in me as a person, nor in my culture. They are primarily interested in money. Either they want to sell me something, or they want to learn English from me, to be able to receive a better education and a better-salaried position, or something else. By contrast, a large percentage of the people with whom I speak in Esperanto are interested in me as a person, or in my culture. Many of them want to become friends, and in fact many of them do become friends. Equality. If I speak English with a Japanese or someone else whose native language is not English, I always, without fail, have the position of an expert in the language, and, it doesn't matter how much that other person has studied English, he or she must necessarily speak from a lower position, as pupil to teacher or subordinate to master. If instead we talk in the language of the other person, for example Japanese, the situation would be the same but in the opposite direction. Such inequality is a great hindrance to friendship. Opening doors. During my long global journey, Esperanto opened a huge number of doors for me, both figuratively and literally. I passed the night in 150 homes as the guest of Esperantists during the three-year journey, and paid for a hotel only once! Through Esperanto and Esperantists I was able to enjoy a very rich culture, meet many different people and intimately get to know their lives, cultures, homes, thoughts, etc. Some of my good friends, after years of friendship, have admitted to me that, before meeting me, they disliked Americans. So if I had used English I would certainly not have been able to become friends with these people, who are now very dear friends. Esperanto has indeed opened the door to them. Helping the world. When working to spread Esperanto, I have the feeling that I am doing something useful for the world. If people throughout the world can communicate freely as equals, and become friends through Esperanto, the world will certainly become better, more just, more likeable. I don't imagine that Esperanto alone will solve all the world's problems, but it can help people devise solutions. Creativity. I love to use Esperanto, because it leads to further creativity. Because of the language's great flexibility, I feel freedom when writing or speaking in Esperanto by comparison with English, whose structure and vocabulary are relatively fixed. The possibilities for creating new expressions in Esperanto are almost unlimited; it's a great pleasure to explore them and find striking expressions by using already existing units. Valuable experiences and self-confidence. When passing through the doors that Esperanto has opened, I have gained many valuable life-experiences which I could not easily have had without Esperanto. Such rich experiences have contributed greatly to my self-confidence, and prepared me to act more competently in the world. A new world-view. Perhaps the most important profit I've gained from my use of Esperanto is a drastic change in my world-view. Previously, I imagined that the world was full of foreigners -- people very different and inaccessible. You can't reach much of a meeting of the minds with "foreigners" because they are foreign, right? But because of my experiences using Esperanto, I discovered that this image was very wrong. The world is full, not of foreigners, but of people just like me and my family. And, more, a great number of those people want to be my friends, if they have the chance to meet me and get to know me. So they are not foreigners, but friends or future friends. What a difference! Now I feel myself linked in reality to people throughout the world. And I no longer fell myself tied to only one part of the world, to only one language, only one culture. I am free to interact with people throughout the world, because there are friendly people everywhere, and because Esperanto gives me the means of easily speaking with them. Why we should learn Esperanto? The first practical reason which I want to mention is to enjoy yourself. By means of Esperanto you can meet and become acquainted with many good-hearted, interesting, educated, clever, talented persons. You can travel to various countries throughout the world. You can participate in truly international parties. You can hear music and join in dancing the dances of many cultures. The whole planet can become your playground. The second practical reason is to have like-minded friends (some of whom you have not even previously met) who will greet you and welcome you anywhere in the world. Sometimes they will even invite you to eat with them and stay in their homes in far-off lands. As Esperantists often say, "If you want to gain money, study English; but if you want to have friends, learn Esperanto." Undoubtedly it is a true saying that Esperantists have good friends everywhere. Beyond that, don’t forget that sometimes Esperantists even find a husband or a wife as a result of belonging to the Esperanto community. The third practical reason for learning Esperanto, especially for children in English-speaking and Asian lands, is that Esperanto provides a good way of beginning the study of a language other than your native tongue. Various experiments show that pupils learn the rule-guided language Esperanto more rapidly than European national languages such as English and French. Furthermore, one can observe that pupils who first study Esperanto instead of more difficult languages are afterwards more eager to learn still other languages. They feel confident that they have the capability to do that. On the contrary, the study of more difficult languages like Latin and English often discourages pupils from trying to learn other languages. Let me turn now to the second kind of reason for studying Esperanto, namely, to expand your mind in order to have a better understanding of the world. As Canadian Esperantist Dr. Stevens Norvell of Nova Scotia rightly notes, Esperanto is "a window to the world." When you are able to read and hear Esperanto, you can use it to become informed about other countries, other cultures, and other viewpoints through books, newspapers, magazines, sound-tapes, videotapes, radio and television broadcasts, web-sites, and web-messages. You can acquire information from a neutral point of view about what is happening throughout the whole world. Furthermore, it is not only specific information which you can acquire. You will also gain a better general understanding of the world. You will no longer be so tied by language to one small region of the Earth and the viewpoint of that language or cultural community. You can become acquainted with the whole human community. The third kind of reason to learn Esperanto is for me personally the most important. It is the moral reason, and it has two sides. First, you can have a relationship with other persons throughout the world on the basis of equality and justice because you are using the world-wide neutral language Esperanto instead of your own national language. You will not require others to use your language, and they will not require you to use their language. Consequently there exists a feeling of equality and justice between you and others. The second aspect of the moral kind of reason for learning Esperanto is the fact that, as an Esperantist, you are helping to create an evolving harmonious global community. Through Esperanto you become part of an important historical movement which promotes a sense of solidarity among all humans. Esperanto is not only a language. We Esperantists constitute a totally new kind of universal community based on the use of our global language. We together are now moving beyond the inter-nationalism of the twentieth century to the globalism of the twenty-first century. Nevertheless, at the same time we are helping to conserve the many national languages in the various parts of the world, thus preserving linguistic diversity. Undoubtedly there are other reasons for learning Esperanto which I have not mentioned. The situations and motives of humans are very diverse. Neverthe-less I hope that the ideas which I have presented here will help you to persuade others that they should learn Esperanto and become members of our evolving global community. Please follow the links in English. If you are fluent in Spanish, you may also follow the links en Español.